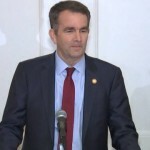 Calls are mounting for Democratic Virginia Governor Ralph Northam to resign after a photo surfaced from his medical school yearbook page showing a man wearing blackface posing next to a man wearing a Ku Klux Klan outfit. On Friday, Northam apologized for the photo in his 1984 Eastern Virginia Medical School yearbook. Calls are mounting for Democratic Virginia Governor Ralph Northam to resign after a photo surfaced from his medical school yearbook page showing a man wearing blackface posing next to a man wearing a Ku Klux Klan outfit. On Friday, Northam apologized for the photo in his 1984 Eastern Virginia Medical School yearbook. However, on Saturday, he reversed course and claimed neither of the men in the racist yearbook photo was him as he initially thought. As Northam resisted growing calls for his resignation, he admitted to a separate instance of blackface: darkening his face to imitate Michael Jackson in a 1984 dance contest. Meanwhile, a separate 1981 yearbook from the Virginia Military Institute has surfaced revealing Northam was known by the racist nickname “Coonman” as an undergraduate student there. Lamont Bagby responds who is chair of the Virginia Legislative Black Caucus, and who is calling for Governor Northam to step down. Democratic Virginia Governor Ralph Northam is facing calls to resign after a photo surfaced on his 1984 Eastern Virginia Medical School yearbook page showing a man wearing blackface posing next to a man wearing a Ku Klux Klan outfit. Northam apologized for the photo on Friday, but walked back his statements on Saturday, claiming neither of the men in the photo was him. He did admit to using blackface to portray Michael Jackson at a dance contest. Reverend Kevin Chandler is interviewed who is president of the Virginia State Conference of the NAACP. More than 1,600 prisoners at a Brooklyn federal detention center were forced to endure freezing temperatures during last week’s polar vortex, with no heat, no light, no hot water for showers and no hot meals. Demonstrators rallied throughout the weekend to protest the conditions at the Metropolitan Detention Center, which is run by the Bureau of Prisons. Prisoners communicated with protesters by banging on the jail windows. On Sunday afternoon, some of the protesters, including family members of those incarcerated, were pepper-sprayed by guards. Democracy Now! was there on the ground. By 6:30 p.m., officials said electricity was restored. Brad Lander is a New York city council member who spoke with prisoners and prison officials this weekend.